We have a full review of the Shock Treatment DVD and disc content on a separate page on TimeWarp.org.uk, this page is intended to show what you get in the package. Billed as The Rocky Horror Picture Show 30th Anniversary Collector's Edition each "Lips" Box Set has a unique serial number printed on the outer packaging and will be limited to 10,000 copies. The rrp is £69.99, but we noticed that Amazon were currently selling the Box Set for 34% discount at £45.99 (price at Saturday, April 29th, 2006). Of course The Rocky Horror Picture Show was released in 1975 and was first screened in London on 14th August, so I guess we're just about in the 30th year even though it's 2006? All this is contained in a 15" x 8" (38 x 21 cm) "Lips" box made of sturdy vacuum-formed plastic, which is printed on the front with the lips image. This all sits within another plastic box, with a clear front so that you can see the "Lips" box inside. This will make it easier for the lip box to be transported and displayed without getting damaged. The outer box will carries the limited edition numbering (Fox are only producing 10,000 of the lip boxes, each individually numbered). 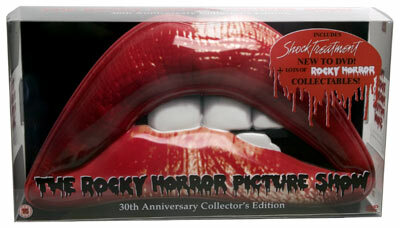 The whole package gets a 15 certificate, due to the content of the Rocky Horror Picture Show disc. The "Lips" box itself is very well designed, the surface printing is so good that when I was taking the photographs for this review several people at the studio thought it was made of tin rather than plastic. We have a 360o Quick Time VR image of the "Lips" Box on the site so you can spin it around and have a look at just how well it catches the light. Billed as a Two Disc Special Edition, this is in fact exactly the same set that was released for the 25th anniversary with slightly updated artwork on the cover. We have a full review of the 25th anniversary release of this disc already on the timewarp.org.uk site. For full details of what is on the discs please click here. One thing that isn't included this time around is the small booklet that was inside the 21st release, pity as it had some really nice images. The inside sleeve of the discs case does feature the chapter stops though. This is an eagerly awaited release of the "sequel" to the The Rocky Horror Picture Show and fans won't be disappointed by the picture quality. The disc included just the Theatrical Trailer in way of any extras and the packaging itself misses an opportunity by not listing the chapter points on the blank inner cover, there is nothing in the way of a booklet either. Only ever available in the UK before as an import disc (at around £10 - £15) the soundtrack to the movie is a nice inclusion for the Box Set. This is a 24 page book 7" x 4" (17 x 11cm) based on the old of print Audience Participation Guide that was release several years ago. 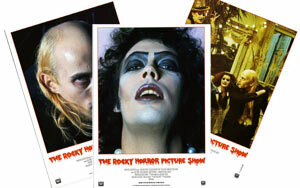 Sal Piro, author of the book and president of the International Rocky Horror Picture Show fan club has rewritten parts of the guide for this re-release. As always with this guide, it's not a bible as far as participation goes. A lot of the responses listed are very American, which of course is where the whole A.P. thing started. For instance the listed ap line before Brad says "Didn't we pass a castle" is "What's White and sells hamburgers?" Means nothing to us across the pond, but in the U.S.A. there is a chain of fast food restaurants called "White Castle". Fun as a novelty item, but don't take a copy to the stage show! Also included in the set are three Glossy photographs, by legendary photographer Mick Rock. Each is presented on a 7" x 5" (18 x 13cm) "lobby card" sheet. These are not the images that are shown on the back of the outer box for the package, rather three that haven't been seen much in print, unless of course you've spent out on the Mick Rock Rocky Horror Book. The images are thoughtfully packaged in a small photographic slip case to protect them. These are nicely printed and would look great window mounted and framed. Another reprint. This is the first of the three Rocky Horror Picture Show comic books reprinted to a 7" x 5" (18 x 13cm) size to fit in with the rest of the packaging. Basically it's the story told in comic style, running from the opening credits to the point at which Rocky is born. A nice item to include in this Collectors edition, but it would have been nicer to have the complete series of books included, or at least an option to order the other two books in the series at this size. Rounding off the package is a small 7" x 5" (18 x 13cm) Certificate of Authenticity. "Twentieth Century Fox Home Entertainment hereby confirm that this box set is one of 10,000 individually numbered limited edition copies produced in 2006 to celebrate the 30th anniversary of The Rocky Horror Picture Show"
It's a pity that the certificate itself is not numbered the same as the outer packaging of the Box Set.